China will soon become the world's largest blueberry consumer and producer, said industry leaders. Andres Armstrong, chairman of the International Blueberry Organization, told the 2014 International Blueberry Congress on Friday, in Qingdao, Shandong province, that China will overtake the United States in the near future. Armstrong, who is also executive director of the Chilean Blueberry Committee, said Chilean blueberry exports to China have been growing by 50 percent every year, since the country can supply fruit during China's winter. He said world production and consumption will continue to rise, with North America accounting for 80 percent of the global total, although Europe and Asia have "big potential" for growth. 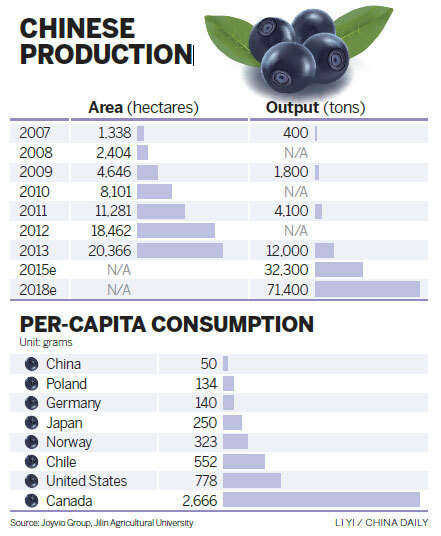 Chile's blueberry exports to Europe rose 14 percent last year, with those to Asia up 42 percent. Chile's harvest arrives in China from December through March, which complements Chinese production, he said. Chen Shaopeng, senior vice-president of Legend Holdings Ltd, and chairman and president of Joyvio Group, a high-end fruit grower and food retailer, said China's blueberry production has expanded quickly and there is huge potential to increase consumption of the fruit. He said China's blueberry-growing area has grown rapidly to the world's second-largest by area, with 20,366 hectares in 2013. Armstrong said that in terms of production capacity, the US and Chile are still in first and second place since most Chinese plantations are new. Joyvio has acquired Wallen Agriculture (Qingdao) Ltd, the country's largest blueberry grower, and invested in entire production chains for the fruit. Joyvio's fruit business includes kiwi and cherries. Last year, it acquired five plantation companies in Chile to provide fresh fruit for Chinese consumers during the winter. Joyvio is also working with Perfection Fresh in Australia to provide fruit, including table grapes, cherries and mangoes.